Oh, the first day of school! It’s such a fun, but chaotic day. Most of my first days are a little bit of a blur. This is why I have to write very detailed lesson plans or I’ll forget everything from that day. I always try to have the same activities for that first day every year. This definitely makes the first day every year run smooth. One of my favorite activities I do on the first day is from one of my favorite books. 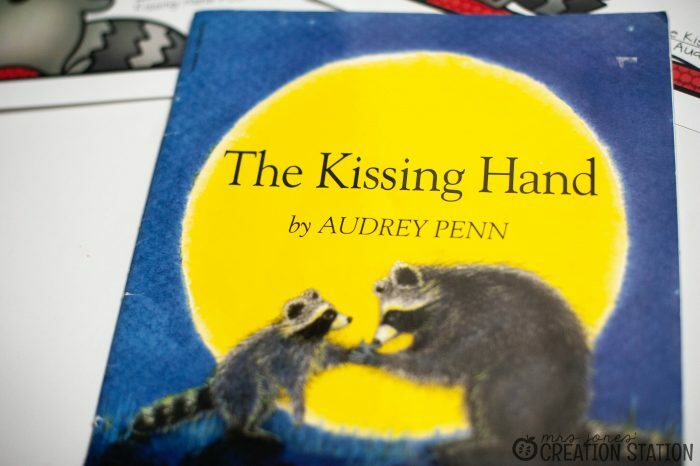 The Kissing Hand by Audrey Penn is a great book to read the first day of school. Most students on their first day can easily relate to the story. The first day of school can be so overwhelming for little ones. I love how Audrey writes a story that students can make connections with. 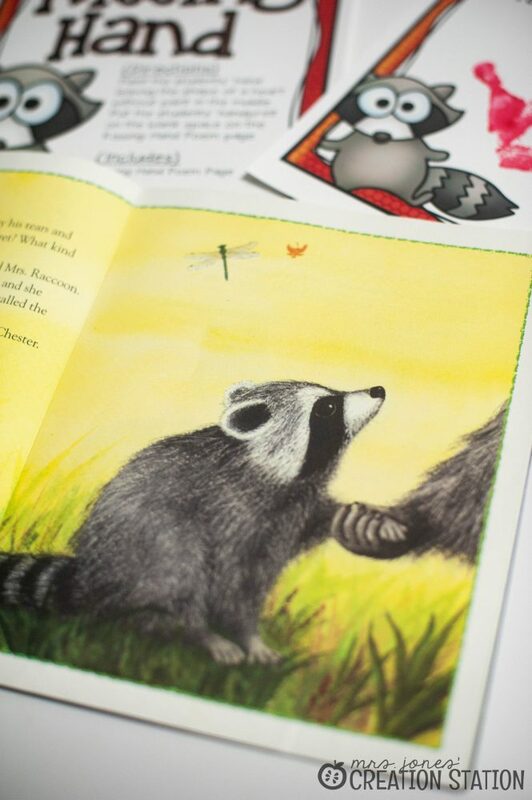 Chester Raccoon is scared about the first day of school. His mom finds a way to make him feel better and this leads to a great discussion at our circle time. My students love sharing ways their parents or grandparents make them feel better when they are scared. A lot of the times my students will piggy back off of each other and before I know it, they are leading the discussion and I just sit back and listen with a huge smile on my face! 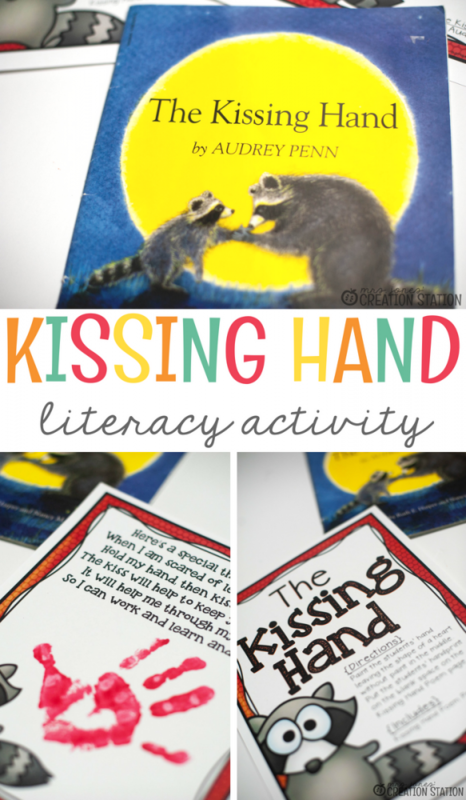 I created a fun craft that my kids absolutely loved. It’s a great way to show parents that the first day of school isn’t so scary. Have the page printed on card stock and ready to go on the first day. 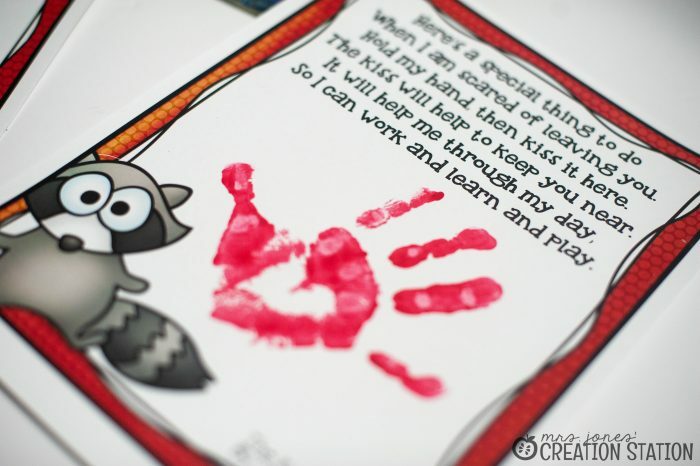 I always used paint for this craft for two reasons…it looks much cuter and is a great incentive for the kiddos to work towards. While my students participated in Math Tubs, I called each student one at a time and painted their hand. 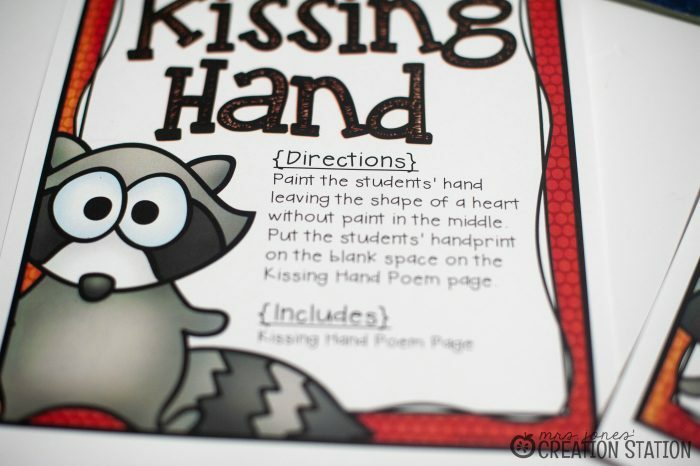 Using a paint brush I would leave a heart shape in the center of their hand without paint while painting the rest. Their small hands fit perfectly on page and since we had Math Tubs in the middle of the day the pages were dry and ready to go by the end of the day. 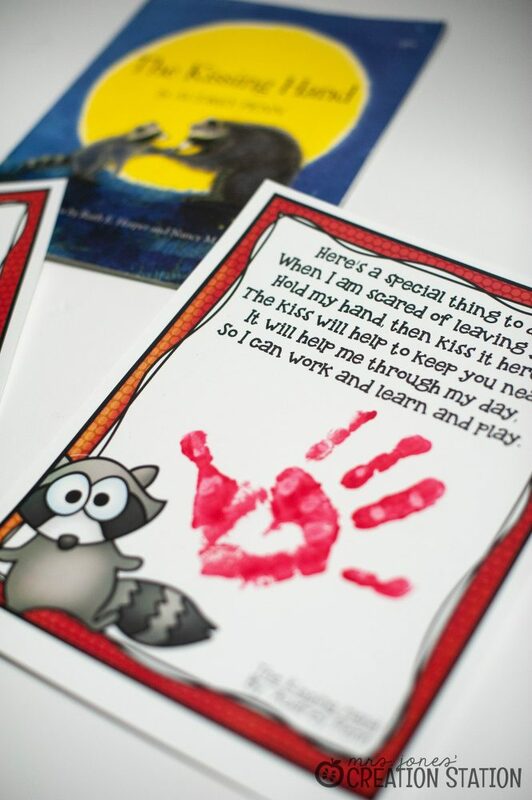 These pages make a cute craft to hang on the refrigerator after the first day! 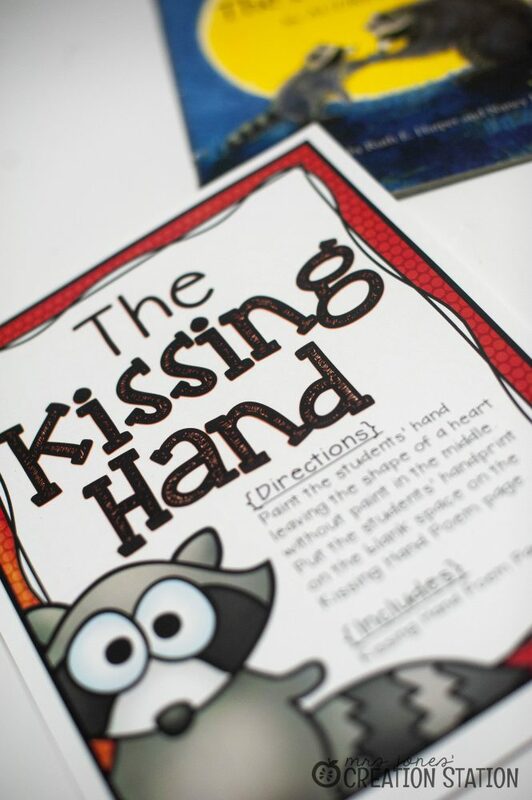 To grab your free copy of the Kissing Hand Craft, click on the download box below! Another great resource to use on the first day of school is my Golden Rule activity pack. It’s a great way to show your students how to treat others! Take the stress of the first week of school off your plate! I’ve got you covered with tons of fun activities for the first week of school with my First Week of School pack! So many new things for little learners in a school. With a new class and possibly a new school, make them feel more at ease with my Chicka Chicka Scavenger Hunt!